BlueStacks is one of the most popular and perhaps the best Android emulator​ for PC. The software bridges the gap between an Android phone and PC by allowing users to install and run most of their favourite apps and games on their Windows and Mac OSX. 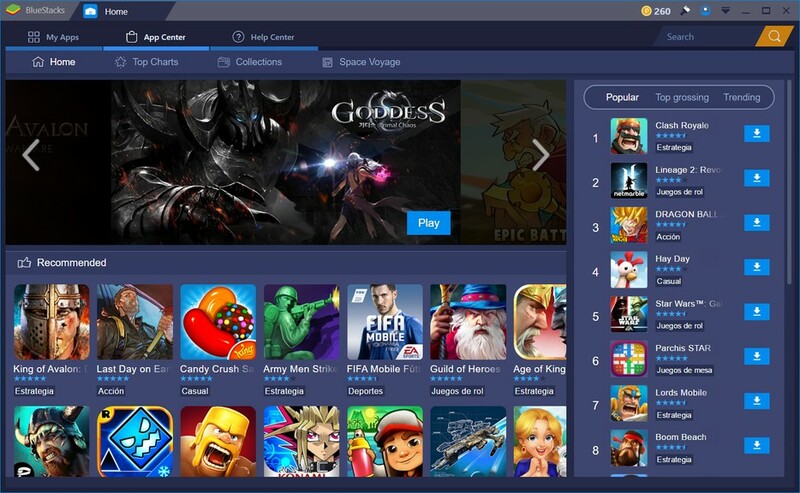 BlueStacks has over the years grown with the Android ecosystem, bringing major fixes that can help users sign in and access the Google ‘Play Store with ease. BlueStacks proves to be the best way to taste Android on desktop and laptops, but if you’d wish to get more functionalities, then you’ll need to get your BlueStacks rooted. 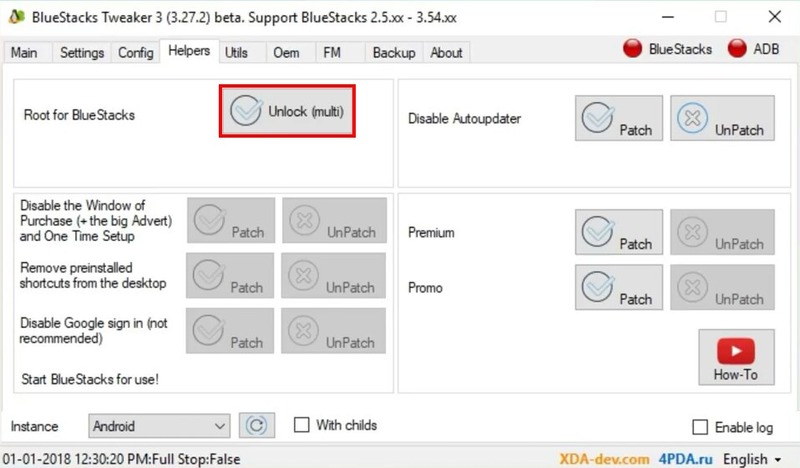 Obviously, there are several reasons to root BlueStacks, and this reasons are same as the reasons to root an Android phone. But there’s one thing you shouldn’t be afraid of, and that’s voiding your PC warranty. You’re already aware of the fact that BlueStacks is just an emulator running on PC, so it isn’t an actual Android device and hence when you decide to root blueStacks on PC, you are not voiding any warranty. The steps to root an Android phone. 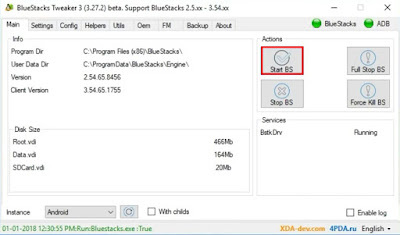 is quite simpler compare to the steps to root BlueStacks. But even if it seems complicated, there will always be a workaround. If you are wondering the difference between BlueStacks 2 vs. BlueStacks 3 to help you decide whether to upgrade or not, then you are at the right place. BlueStacks​ 2 gained a lot of fame in 2016 and in 2017, it became even more popular. One of BlueStacks 2 most notable feature is the ability to run multiple Android Apps and games at the same time. BlueStacks 2 can be rooted in less than 2 minutes using KingRoot, but you wouldn’t want to go through the hassles of changing KingUser to SuperSU. 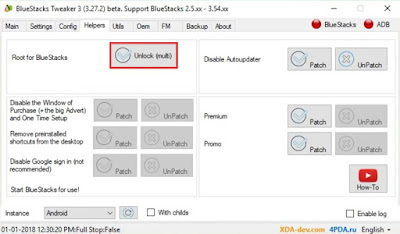 So it’s safe and always recommended to root BlueStacks 2 using BS tweaker. BlueStack 3 debuted in 2017, bringing a new and better keymapping interface. For one thing, BlueStacks 3 consumes very low RAM and it’s much faster. Aside from this, there’s a “MOBA Mode” and chat feature integrated in BlueStacks 3 to help users play RPGs and chat with other users while playing games. 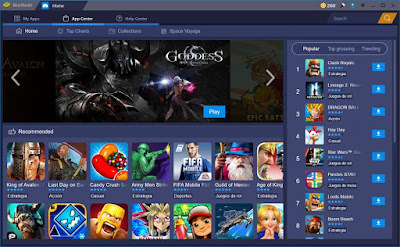 BlueStacks 3 also brings a new App Center and multi-instance that comes in handy for running multiple versions of BlueStacks in same window with different Google account. So you see, it’s definitely worth upgrading to BlueStacks 3. 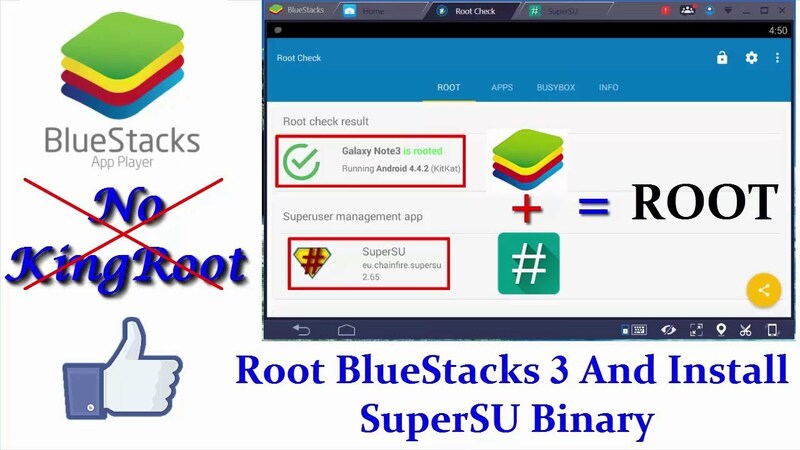 Now without further ado, here is how to root BlueStacks 3 and Install SuperSU. To begin with, you will need to download and install BlueStacks on your Windows PC. Do not that BlueStacks offline installer download size is around 325MB and its installation process is hassle-free. Once you have BlueStacks installed, go ahead and log in with your Google account to enable you access (the already baked in) Play Store and install apps with no fuss. 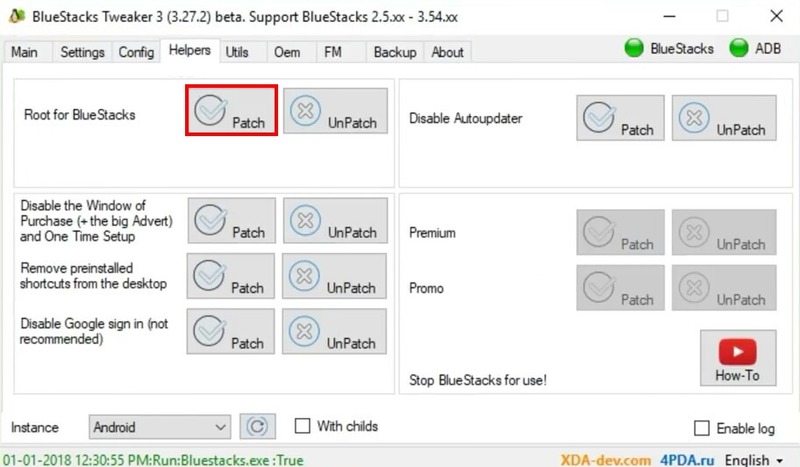 Now you will want to check whether your BlueStacks is rooted or not. So head over to “My Apps” >> “System Apps” and open Google Play Store. From here, search for Root Check and install it. Now open the app after installation and grant permissions if prompted. 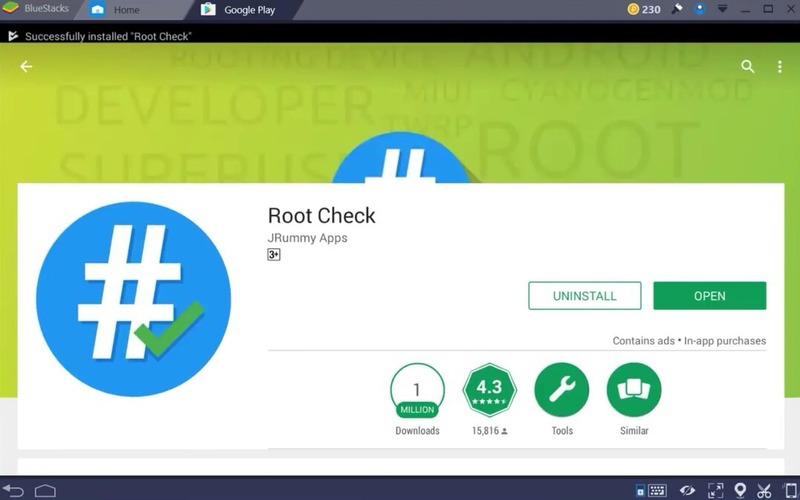 Once you’re done, click on “verify root” and you’ll get a message that your BlueStacks is not rooted. Next up, we’ll need to download the latest version of BlueStacks tweaker. BlueStacks tweaker is simply a program or tool that can be used to modify and root BlueStacks with ease. So simply minimize the BlueStacks program and make sure it’s running in the background. 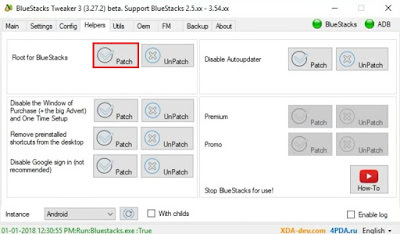 Now head over to xda-developers and download BlueStacks Tweaker 4. Then extract the zip file using winrar and launch the BlueStacks tweaker program. Now it’s time to get your BlueStacks rooted. So go ahead and open the BlueStacks program you minimized before followed by BlueStacks tweaker. Then on BlueStacks tweaker, click on Full Stop BS to force kill all the running services related to BlueStacks. Once the services are stopped, head over to the “Helpers” tab and click on the Unlock (multi) button next to Root for BlueStacks. This will instantly unlock the patch and unpatch options. Next up, head back to BlueStacks tweaker “Main” tab and click on the Start BS button This will automatically make the patch and unpatch options accessible and will also start the BlueStacks program. 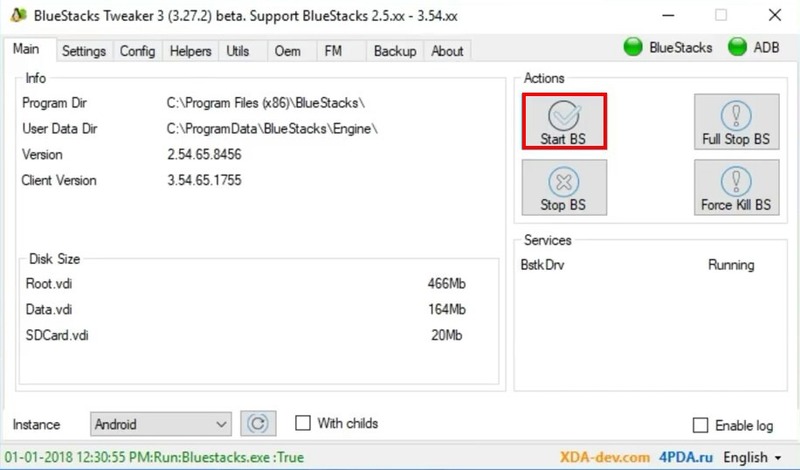 Now simply go back to the “Helpers” tab on BlueStacks tweaker, then click on the Patch button and wait for a few seconds to complete the rooting process. Now go to “My Apps” on BlueStacks and open root check. From here, you’ll see that your BlueStacks rooted. That’s it, you can now close the BlueStacks tweaker. Your BlueStacks rooted right? But there’s one crucial thing left to be done, in other to grant root access to apps that needs it. So we’ll need to install SuperSU. To get this one going, simply open BlueStacks and go to ‘My Apps’ >> “System Apps”. From here, fire up Google Play Store then search for SuperSU and install it. Now open SuperSU and click on the “Start” button. From here, click “Continue” from the pop-up to update the SU binary. On the next screen you will get a pop-up asking you how you will like to install the SU binary. Simply click on “Normal”. Now wait for the installation process to complete and you will see another pop-up asking you to reboot your device. Simply click “Ok” to this message and exit SuperSU. Now open “root check” and grant super user request. 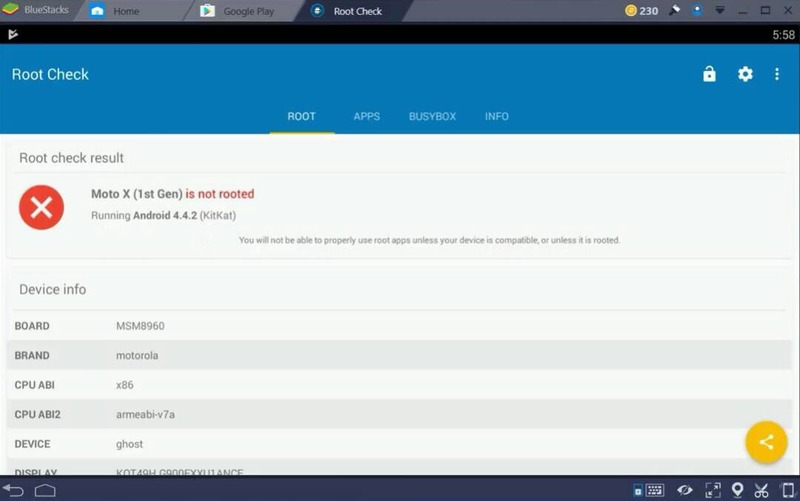 Then you’ll see that your BlueStacks is properly rooted. 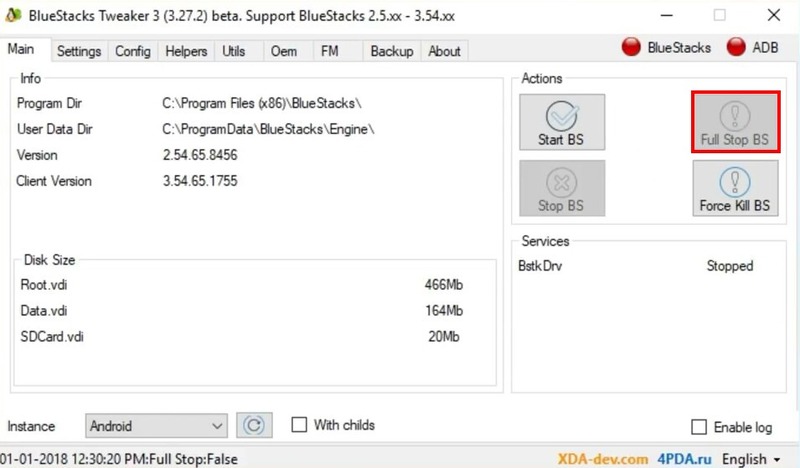 BlueStack App Player comes in handy for those who’d like to run and install Android apps on their Windows PC. The program itself is versatile and can perform better once it’s rooted. So simply go ahead and root BlueStacks using the guide above, to enable you run apps like never before.